mountain terrain of the Maine back country. because it’s especially stunning in fall foliage season. recommended during the popular fall foliage season. then follow Route 6/15 north to Greenville. At Greenville stop and relax for a bit. A 20-mile excursion east of Greenville takes you to beautiful Gulf Hagas. is a must-do side trip. the fall season ... book early. 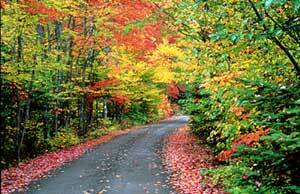 drive is all about Maine wilderness. the hills and on scenic lookouts across the lakes and ponds along the road. a canoeing center, famous for the 42-mile Moose River Bow Trip. organized tours are run by local operators. wonderful scenery for us to admire. If you’ve got a camera -- use it! also makes an ideal fall foliage weekend jaunt.